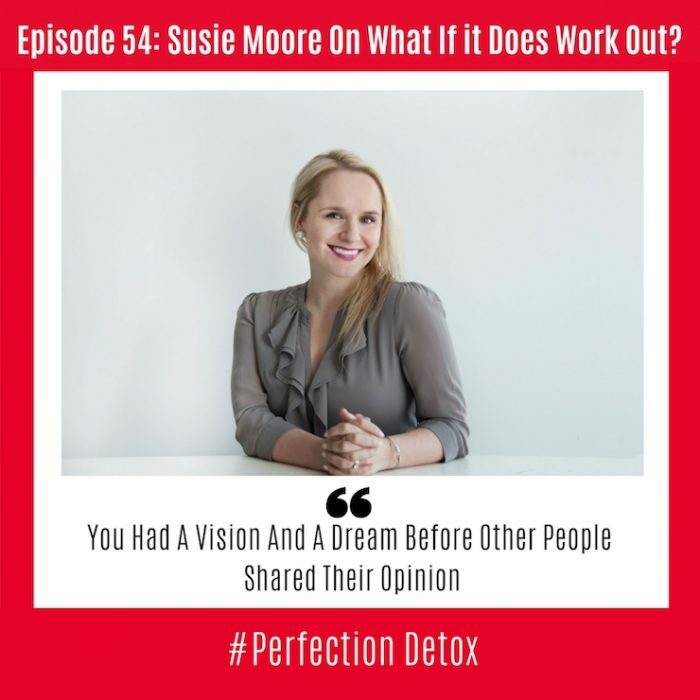 Episode 54: Susie Moore: What If It Does Work Out? My dear friend Susie Moore releases her new book this week, What If It Does Work Out? and in this week’s conversation she shares her road to success that began in England. We talk about how she transitioned from being a self-published author to being picked up by traditional publishing, and what it took to get there. Susie inspires and encourages us to go for our dreams and in this episode gives us tips on how to shift from thinking big to doing big. We talk about the excuses that we all use to deal with our fears and how we all tend procrastinate around things that we really care about. We talk about the importance of receiving and learning from feedback, and the courage needed to get our stuff out into the world before we feel we are ready. Susie believes that we all have an unique voice, one that needs to be shared with the world. She encourages us to begin by teaching what we believe in and reminds us that we only need to know a little more than the people we want to inspire. Both Susie and I are from England and we talk about the culture that taught us to not stand out or go for our dreams. We share how we both created a life based on trust and hope and possibility, and Susie talks about the importance of surrounding yourself with a tribe of people who will support you and your mission. That may or may not be your family or the culture you grew up in. Susie shares the importance of creating your own rituals and systems that will feed both you and your inspiration. She believes that we all have the ability to take our life back from the predictable, and that creating a side hustle is one way to become creatively fulfilled and tap into your purpose. She shares her story of how she left her corporate job and became the side hustle expert. We talk about the power of the gig economy and that there is no such thing as job security and that in this day and age, having a side hustle is a way of creating some security in an uncertain world. We talk about “time” and that often when we say “we don’t have the time,” what we really mean is that we are afraid. We explore how to minimize our fears, maximize our time, and create actionable steps that we can use to move forward. We also talk about how to create an environment that will allow you to focus and thrive, whatever that may be for you. Susie says one of the most important things to spend time on is knowing yourself and what works for you and your strengths. One of the key action steps you can take is to notice when your golden hours happen, and then make sure you reserve them for your best work. We both share the fact that neither of us have the qualifications and letters after our name that we often think we need to be successful – and that it is easy to become a procrastalearner, continually learning and researching but never sharing your own work. Susie reveals that often your hobby is the very thing that could be your first hustle. What are your strengths? Perhaps you bring them to the forefront and turn your strengths into another source of income. It can be that easy. What are you good at? What do you love to do? What do your friends know you for? Can you start there? What If It Does Workout? Susie has been featured on the Today show, Business Insider, The Huffington Post, Forbes, Time Inc., MindBodyGreen, and is the resident Life Coach and Columist for Greatist. Susie’s insights have been shared by thought leaders including Arianna Huffington, Paulo Coelho and SPANX Founder, Sara Blakely. When she’s not working, Susie can be found exploring New York City, planning her travels (next up: an extended stint in France!) brewing the perfect cup of English Breakfast tea, and spending time with her husband Heath and their tiny (not very bright but certainly very loveable) dog, Coco.